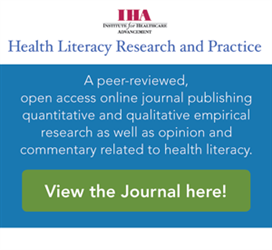 If you’ve been part of the Health Literacy Discussion List (listserv) for years now, you’re in for a treat. The Center for Health Literacy Solutions has a discussion module that is a significant upgrade to the current Listserv. Health literacy community members can engage in broader, deeper discussions around specific issues or interests. You can leverage the power of the community and create your own targeted discussion groups. Or, you can keep receiving the listserv in your email inbox like you have been. What fees are associated with the Center for Health Literacy Solutions? None! It’s absolutely free to use at no cost to you – it’s all sponsored by the Institute for Healthcare Advancement (IHA). What do you do with my information that is stored within this community site? All the information that is contained within the Center for Health Literacy Solutions is private and will never be sold. Please feel free to visit our Terms and Conditions page which will include community rules & etiquette, and privacy guidelines. 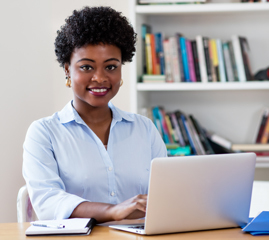 Below are a variety of "How-To" tutorials and instructions to help you navigate and utilize the features of the Center for Health Literacy Solutions. How do I log in if I'm already a member of the Health Literacy Discussion List (Listserv)? Click on the Did You Forget Your Password? link found in the "Login or Register" page, here. Enter the same email address you used to volunteer for beta testing or the same email address you registered with on the Listserv. Click on the red "Send Password Link" button. You will receive an email from us containing a link to reset your password. Be sure to check your spam folder if you don't see it in your inbox. You will be taken to a page that will allow you to specify a password. Type in your password and again below it as confirmation. View a video on logging in for existing Listserv users. From the Center for Health Literacy Solution home page, click on the Create your Free Profile link. On the "Create Account" page, enter your demographic information. At minimum, we require your email address, first, and last name but the more information you provide to the community, the better the experience for all. Don't worry, you can control who sees what within your new profile. Click on the "Create Account" button. You will be sent an email asking you to verify your email address. Click on the link provided in that email. Your account will be sent to an admin for approval. Once approved, you will receive an email letting you know. You can now set up your password. Instructions on how to reset your password are below. How do I set up or reset my password? From the Center for Health Literacy Solutions, click on the red "Sign in" button at the top right. Click on the Did You Forget Your Password? link or click here. Enter your email address and click on the "Send Password Link" button. Check your email inbox for the password reset email. Be sure to check your spam folder if you don't see it. Click on the link contained within the password reset email. On the password reset page, type in your new password and then again below to confirm it. 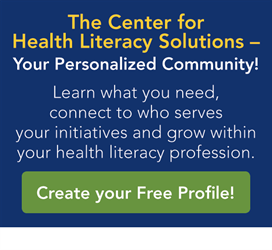 You may now log into the Center for Health Literacy Solutions. Completing your profile is important to other members and informs others of your background, education, and professional achievements. We suggest uploading a profile picture as your first step in completing your profile. You can then add a short bio, education, and job history. The platform can automatically pull pertinent profile information from your social media accounts. Worried about privacy? You can set privacy settings and control who sees what under "My Account" within your profile. Log into the HealthLiteracySolution.org site. Up at the top right hand corner of the site, click on the green down arrow. In the small window, click on the green Profile button. Your Profile page will display. This page permits you to add a profile picture by clicking on the green Actions button under the profile picture. You may also add a short bio, your education and job history by clicking their respective Add buttons. Clicking Add under Social Links allows you to link your social media account with your Health Literacy Solutions Center profile. Communities allow you to participate in discussions and share resources with other members. Each community has its own discussion posts, shard file library, announcements, and blogs. You must first join a community in order to interact with its members. All members are joined to the Health Literacy Main Community by default. This community operates as the central community. Hover over “Communities” and click on “All Communities” in order to see a list of available communities. Click on the community that you wish to join and simply click "Join". Then choose a delivery option for posts (Real Time, Daily Digest, Legacy or No Email). See above for the steps on how to list communities. Once you find the community you wish to post to, enter that community's Discussion area by clicking on any one of its Discussion buttons or links. From the community home, you can also click on "Add" next to "Latest Discussion Posts". Type in your message in the body. Edit your signature, if you need to. If you want to attach a file to your post, click on the Attach button. Click on Send when done. Viewing and searching through the Resources database requires member login. Visit the Find a Resource page to begin searching for tools, articles, fact sheets, and other helpful items. Note: You must log in to view or search through the database. Searching through the resources only searches through the Resources database and NOT the entire site. Use ordinary terms for searching the title, description, and keywords. For example, are your looking for childhood asthma? Try searching for "child asthma". Topic Areas: One of the five categories (Becoming a Health Literacy Professional, Becoming a Health Literate Organization, Emergency Preparedness, Evaluating your Health Literacy Work, or Tools for Effective Communication). Measurement: Some resource authors provide specific measurement methods. How do I comment or rate a resource? Each resource item can be rated and commented. To add a rating, select a rating from 1 to 5 and click Submit. To comment, type in a comment and click Submit. 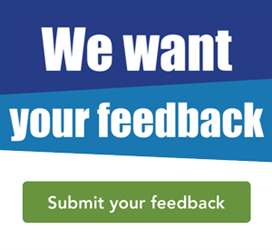 If there is a problem with the resource, please click Yes under your comment to let us know. What if the resource has a bad link or other problem? Visit the Share a Resource page to share tools, articles, fact sheets, or other helpful items. Fill out the form as completely as you can and provide as much information possible. Our community gets stronger and our voice becomes louder when we contribute feedback to make the Center for Health Literacy Solutions become "Your Community of strength, knowledge, and focus".